EDM - TMK Manufacturing, Inc.
TMK excels in EDM, both Wire and Sinker, and is highly skilled in manufacturing even the most complicated requirements with tolerances to within .0001 inches. Products such as Waveguides, as well as components for the Optics industry, require a depth of experience in close tolerance work that creates the kind of customer satisfaction that TMK is known for. 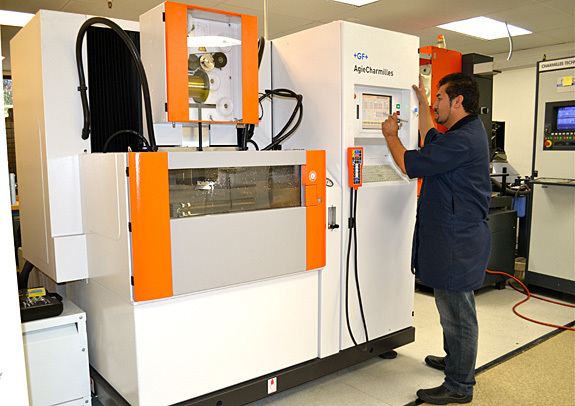 TMK uses a state-of-the-art EDM machining center with a micro-processor numerical control for the automatic machining of workpieces from roughing to finishing, with accuracy and speed.